Sally: Forty years ago, that interstate down there didn’t exist. Sally: Yeah. Back then, cars came across the country a whole different way. Lightning McQueen: How do you mean? Sally: Well, the road didn’t cut through the land like that interstate. It moved with the land, it rose, it fell, it curved. Cars didn’t drive on it to make great time. They drove on it to have a great time. That sort of sums up our philosophy of our family road trips. We don’t set out to get from Point A to Point B in record time. We like to see what’s along the way. 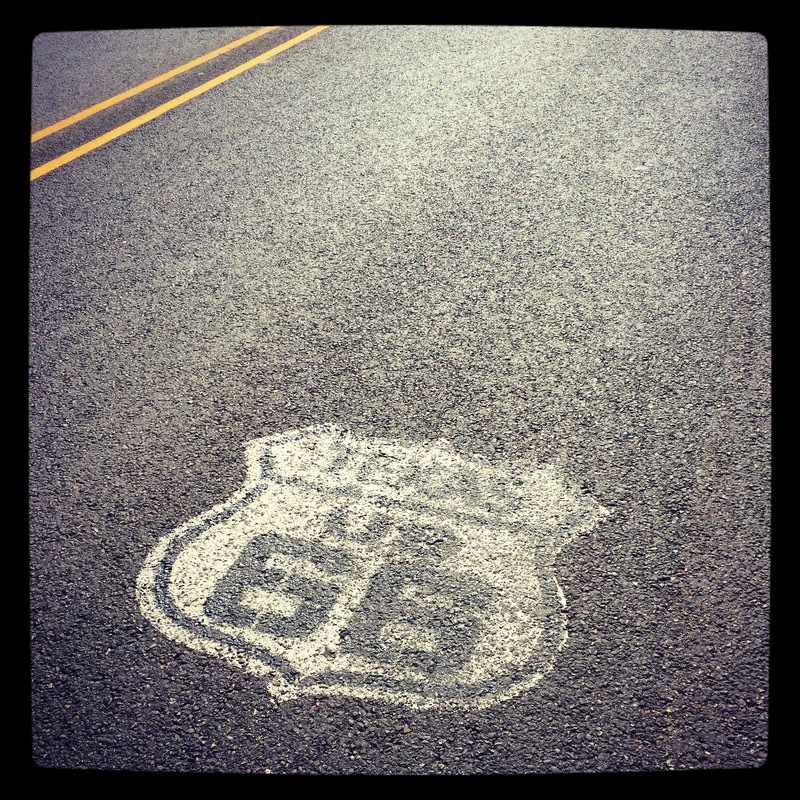 We want to see all those towns that were bypassed by the interstate. And, often, we like to see the towns that were bypassed by the railroads. The landscape is dotted with towns that were once thriving communities with hard-working people. There were fantastic little town squares with courthouses and pharmacies and general stores and post offices and banks. And many of them still stand, mostly empty and unoccupied, left deserted by pioneers and speculators and settlers who came out west to make their fortunes and start their lives. When we road trip, we have rules, and these rules are simple. 1. We do our best to avoid the interstate. With GPS and a host of different apps on our iPhones, we can find our way through the backroads of Texas without too much trouble. Sometimes it’s an interesting stretch of road. Sometimes it’s not. But it’s never a crowded highway with the same signs exit after exit after exit. 2. We avoid chains whenever possible. What is the fun in visiting a new place only to eat in a restaurant that has the exact same menu and the exact same decor and the exact same layout as the city you just left? There are some fantastic mom and pop restaurants and shops out there, waiting to be found. We have had some amazing meals in the most surprising places. Again, we utilize our iPhones to direct us to places, or, better yet, we ask around. One time, we were in an antique/junk shop in a ghost town (I’ll blog about this one!) when the owners practically forced us into what appeared to be a dive bar across the street. What we experienced was a phenomenal little restaurant in the middle of nowhere, filled with the nicest people. Never judge a book by its cover! The only exception to the “no chains” rule I make is when it comes to hotels. My priorities are VERY different when it comes to where I sleep when I am away from my own bed. My priorities are these (in order of importance): 1. Safe, 2. Clean, 3. TV, 4. Texas shaped waffles. 3. One pilot, one navigator. I am the Navigatrix. I’ve mastered interpreting the backroads via iPhone and iPad quickly and efficiently. I follow the car (the blue dot) on the iPad, and I plot our next stop on the iPad, and I use the iPhone to look up other things along the way. There are some fabulous Texas history apps that I use constantly while we are on the road. Texas Landmarks by Atomic Axis is a staple for us on the road. We also heavily rely on Texasescapes.com, Texas in a Pecan Shell (tshaonline.org), Trip Advisor, TX Monthly BBQ Finder, and Google. The Hub drives and I tell him where to turn. If you are going to navigate, you need to pay attention and learn how to read a map. Sometimes I get wrapped up in other things and we miss turns. I like to blame the Hub, but as the Nav, it’s really usually my fault. 4. Don’t pass up a great photo op. Did the Crazy Train drive 45 minutes (one way) out of the way on Thanksgiving Day to take a family photo in Turkey, TX in front of a statue of a bronze turkey? YES WE DID. Another time, we drove for three hours to find a ghost town that bore our last name. Unfortunately, it was the WORST ghost town EVER, and NOTHING remained with the name “Phelps” on it, so we…. 5. Be ready to execute Plan B. Sometimes, like on our trip to Phelps, the town ends up being a big, huge disappointment. So we checked the map and found somewhere else to go. We found that Huntsville is a BEAUTIFUL little town, not just home to a huge prison. 6. Find the history. There’s some cools stuff that happened all around us a really long time ago. Find out about it and go. Fourth grade Texas History was SO easy for my daughter because she had been to all the places they studied. The 1835 “Come and Take It” cannon in Gonzales? She’d seen it. Goliad? Been there. The Alamo? Remembered it. History comes alive when you walk in the steps of those who came before you. And it’s really, really interesting. 7. Technology. See #3. And when you have no signal? There’s this old-fangled thing called a MAP that you can get and fold up and keep in your glove compartment. They are really cheap. 8. Have a small town plan of action. Here’s ours: First, we find the courthouse and/or Main Street. We drive the full length of Main Street (here’s a hint: about 90% of the time, it’s actually CALLED MAIN STREET). Then we turn around and drive it the other direction. Then we drive the immediate side streets. They are often just as interesting, if not more so. Look at the signage (both current and what is painted on the buildings behind the signs). Park and get out and walk. Visit the shops, get some iced tea or a Coke somewhere. Since the Hub is a pharmacist, we ALWAYS try to find out where the town pharmacy was (you can tell by the fixtures). Find the bank– the bank may close, but the vault almost always remains. If there’s a shop in its place, you can usually go into the old vault. If you see something unique and interesting, support the small businesses. They keep these towns alive. 9. What is a town or a region known for? Here in Central Texas and the Hill Country, we’ve got BBQ and Kolache. We LOVE to taste test! Why go into a chain and get something that’s been frozen and shipped to a rest stop somewhere when there just might be a baker like Mimi who has a secret recipe that will stop you in your tracks? Or a pit boss like Miss Tootsie who runs a smoker like nobody’s business. Try it. When we are in the BBQ belt, we get BBQ. When we are in South Texas, we get BBQ. When we are in Czech Country, we go for kolache and sausage. Have a beer in Luckenbach or go to a rodeo in Bandera. Do what a town is known for! 10. Enjoy the journey. We have so much fun in the car. Our trips usually don’t cost more than the price of a tank (or two) of gas and a meal or two on the road. That is MUCH more memorable than an afternoon at the movies and dinner out for 5 people. Julia, as I said before, you are so talented and witty! I am so glad that you FINALLY started this. I’m sure you will have a gazillion followers before too long. And to think, I can say “I knew you when.” Can’t wait for the next post.